A detailed gunmetal colored metal button with stamped skull and crossbones face has been re-purposed into a handmade ring when set upon a silver plated ring base that's adjustable from size 6 and up. This handmade button ring is adjustable from size 6 and up, making it comfortable no matter the size of the wearer's fingers as well as ideal for switching from finger to finger. With a bit of altering to the band, this ring can be made smaller than a size 6. If you need a smaller size, please add the request (including the size you need) to the "Note to StumblingOnSainthood" box in your shopping cart during checkout to make sure I know what to do for you! EASTER SALE Acorn Ring. Acorn Button Ring. Silver Button Ring. Adjustable Ring. Silver RIng. Handmade Ring. Acorn Jewelry. Handmade Jewelry. Yellow Rose Earrings. Bronze Stud Earrings. Flower Earrings. Post Earrings. Flower Jewelry. Handmade Jewelry. Peach Flower Cluster Earrings. Peach Flower Earrings. Silver Post Earrings. Stud Earrings. Flower Jewelry. Handmade Jewelry. Pink Rose Earrings in Resin. Silver Post Earrings. Stud Earrings. Flower Jewelry. Handmade Jewelry. Black and White Skull Earrings. Halloween Earrings. Black Earrings. Spooky Halloween Jewelry. Stud Earrings. Post Earrings. Exactly what I was looking for , it’s beautiful I love it!!! 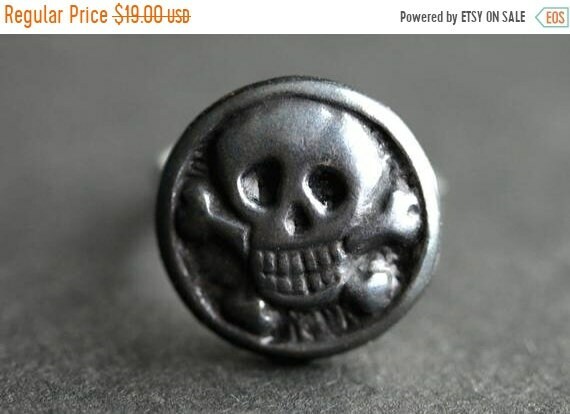 Skull and Crossbones Ring. Pirate Ring. Skull Ring. Gunmetal and Silver Button Ring. Adjustable Ring. Pirate Jewelry. Handmade Jewelry. EASTER SALE Sunflower Button Ring. Silver Button Ring. Sun Flower Ring. Adjustable Ring in Silver. Handmade Jewelry. EASTER SALE Sun Mandala Ring. Silver Sun Ring. Antiqued Silver Button Ring. Adjustable Sizing. Handmade Jewelry. EASTER SALE Copper Celtic Knot Ring. Button Ring. Copper Ring. Adjustable Ring. Handmade Ring. Costume Jewelry. Handmade Jewelry. EASTER SALE Copper Sun Ring. Button Ring. Copper Ring. Adjustable Ring. Handmade Ring. Celestial Jewelry. Handmade Jewelry.